Sharks > Marlin – Ya Like Dags? Tip o’ the hat to Underwater Thrills for linking to this amazing set of photographs. 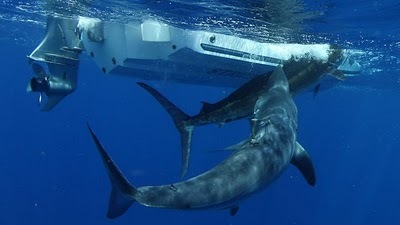 Underwater photographer Alistair McGlashan was in the water taking shots of fishermen releasing a marlin when a shortfin mako whipped past him and proceeded to tear off and eat the marlin’s tail. Fortunately for us, Alistair kept shooting. Make sure to check out the link for the full set, it’s pretty amazing. Bad day to be a marlin. Photo by Alistair McGlashan. I had an experience almost exactly like this in Key West a few years ago, but with a large dorado rather than a marlin. I’d hooked him on light tackle and spent about 20 minutes fighting him. When I finally reeled him close to the surface, I noticed a big gray shape underneath the boat, and thought “oh, look, you can see the shadow of the boat on the sand.” Then I remembered that we were in 600 feet of water. The boat-sized shadow quickly resolved into a tiger shark, my reel screamed, and my fish took off with the shark in hot pursuit. A few seconds later the dorado gave up its fight completely. Reeling it in, I finally landed my fish, or at least the front half of him. It looked like his tail had been lopped off with a sword. How very _Old Man and the Sea_. Took me a second to remember where I had read this story before! Pingback: NOAA Asks Fishermen to Release Makos | Ya Like Dags?